The ET-850 Locking Slide Mount provides convenience, ease of use and security in a black, powder-coat finish that is both attractive and rugged. The ET-850 is a basic platform designed to accept many different makes and models of mobile 2 ways. Custom adapters are provided to fit a variety of radios to the tray. Transfers of different radios are accommodated easily and quickly. Install bases-only in vehicles (or buildings, offices, etc) and then, once radios are mounted to trays, easily move radios from location to location by conveniently sliding the radio and tray into the desired base without any blind fumbling to reach hidden fasteners or screws. To service the radio, simply unlock the mount and slide the radio out. The ET-850 Locking Slide Mount also makes it easy to move different makes of radio from vehicle to vehicle, or location to location because it provides a standard mounting base. Once a radio is mounted into the Locking Slide Mount tray it will easily fit into all the ET-850 Locking Slide Mount base mounts in the fleet. If the locking feature is not needed, simply leave the Locking Slide Mount tray unlocked because the lock cylinder design allows key removal in both the locked and the unlocked position. The locking feature discourages radio theft, unauthorized removal and tampering as well. Ham Operators are aware of the need for increased security and the E TIP Slide Lock provides that security and increased efficiency as well. Read more about how the Slide Lock can save money and improve efficiency. Helps control theft, tampering and unauthorized transfers. Protecting assets is a concern and has even greater importance today. Maximum security is achieved by simply and quickly removing the slide tray with the radio to a secure location. Fits Harris Corp. (M/A Com, Ericsson), ICOM, Johnson, Kenwood, Motorola (Vertex), Uniden, Yaesu among others. 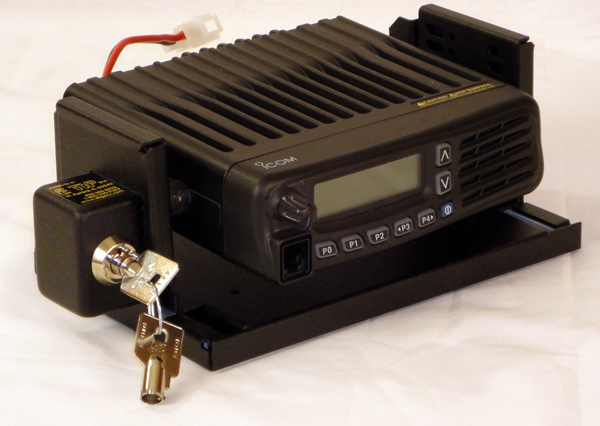 By design the ET-850 Locking Slide Mount accepts many different makes and models of mobile radios. A standard base and slide tray uses adapters to fit different radios to the slide tray. A variety of equipment can be installed and easily interchanged throughout a fleet while controlling unauthorized removal and transfers. The most common use is in vehicles. Other uses include watercraft, command centers, construction office trailers, off road equipment, farm equipment, police and fire equipment, etc. Call for pricing.